Last year Pascal Dupuis took to Derek Jeter's website, The Player's Tribune, to describe parts of his life and his career, especially his struggle with blood clots. 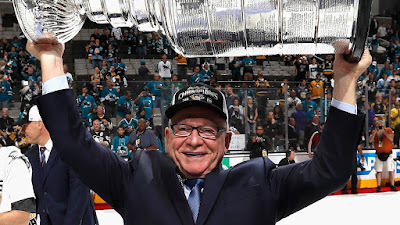 Today Penguins GM Jim Rutherford joined him. Opening with a great story about the Stanley Cup's trip down the hand off line, including anecdotes about Trevor Daley, Pascal Dupuis, and Marc-Andre Fleury, he gets to the true heart of the article. The Players’ Tribune asked me to explain my job, which is kind of an interesting challenge. If you talked to my eight-year-old son, being a general manager is all about signing free agents and making trades. (He comes up with some amazing All-Star-for-fourth-liner proposals during breakfast.) But in reality, that stuff is only about 10% of the job. He goes on to describe his method for building his two Cup winning teams, his time in Hartford, and his "mental box." In July, when it became clear that we had a shot at bringing in Phil Kessel, we had to make a big decision. Acquiring Kessel would cost us not only young talent and draft picks, but it would also come with a significant salary-cap hit. There’s always a cost. In this case, we had to be sure that Phil would fit into our room, and into our system. In times like that, you have to rely on your box. Inside your box is all the stuff you can’t look up on the Internet. During your travels in this game, from city to city, hotel to hotel, you talk to a lot of people. You hear things. You learn all kinds of things about players. And you file it all away in your box. Over my 30 years as a GM, my box has gotten pretty full. The Kessel decision ultimately came down to a simple fact about the NHL that never seems to change: It’s hard to score goals in this league. It’s just hard. But Phil was a guy who had scored them year after year. He had been in a fishbowl in Toronto and he still scored 30 every year. I felt if we gave him a second chance, he’d really thrive in Pittsburgh. So Phil came into our locker room that fall and, after watching him for a few weeks, I filed a new note into my box: Phil Kessel isn’t a good guy, after all. Hagelin seemed like a fit. But why was he playing so poorly out West? What was the potential downside of bringing him here? I hold very few long meetings with my hockey-operations team. Most days, we’ll have about 20 impromptu mini meetings where a guy’s name will come up, and we’ll watch some tape on the guy, and we’ll share whatever info we have stored in our boxes. If a name survives that meeting, we’ll run it through the full ringer: analytics, hockey ops, scouts, and then eventually go to our coaching staff to get their thoughts. If you just looked at the stats, you might think that Hagelin was a risky proposition. But if you watched 10 minutes of the Ducks, you could see why he wasn’t a fit for their methodical, physical style of play. I thought back to him scoring big goals against us in the playoffs, and how he made our defensemen’s lives miserable on the forecheck. In December, a month before we traded for Hagelin, Daley’s name kept coming up in our office. I had really admired his game when he was in Dallas. He was fast, strong and great on the breakout. When the Blackhawks traded for him, I thought it was a good fit. But, for some reason, Daley was really struggling in Chicago. So our team had a mini meeting, and we did what we always do. We watched him. The problem jumped out at me right away. Trevor was on the left side of the TV screen. Trevor is lefthanded. Chicago was playing him on the left side. It is. Most defensemen like playing on their natural side, so that when their defensive partner passes the puck “D-to-D” behind the net, they can catch the puck on their forehand. But I knew from my box that Trevor actually liked to play on his off-side. He played on the right side in Dallas. Watching him in Chicago, you could tell he was uncomfortable on breakouts. There are many, many more great details in the article. More about Daley, Kessel, and Hagelin, all of which are worth your lunch break to take some time to read. Jim Rutherford arrived in Pittsburgh amid much criticism and flak. Some of it was deserved, all of it was answered. If you weren't on board with him after his Stanley Cup win then this article should sway you some more.